The wait for Stanford football is over. After a 249-day offseason filled with tight position battles, endless media hype and dramatic hairstyle changes, the No. 5 Cardinal will finally take the field tomorrow night against San Jose State to begin one of the most anticipated seasons in school history. With an 8 p.m. kickoff time, Stanford is the last college football team in the nation to launch its 2013 campaign. Though the wait for the season opener may have been painfully long, Shaw and the players can find comfort in one impressive fact: Not a single player on the roster is injured. This includes fifth-year senior fullback Ryan Hewitt, who at the start of the week was questionable for Saturday after bruising his knee in the team’s Aug. 24 open scrimmage. However, Shaw announced after Thursday’s practice that Hewitt’s swelling is gone, so unlike last season, the hard-nosed fullback is ready to go for the first game. Perhaps the biggest storyline in the wake of Stanford’s Rose Bowl victory is the wealth of talent and depth that the team retained on defense, a unit that led the country in sacks and tackles for loss in 2012. Ten of those 12 defensive starters have returned to the Farm, including four fifth-year seniors — defensive end Ben Gardner, nickelback Usua Amanam and linebackers Shayne Skov and Trent Murphy — who look to end their collegiate careers by hoisting the crystal ball on Jan. 7. The Cardinal defense will be tested from the get-go by last year’s most accurate passer in the nation, San Jose State quarterback David Fales. In 2012, the junior college transfer boasted a 72.5 completion percentage and threw for 4,193 yards and 33 touchdowns, guiding the Spartans to their first-ever bowl victory and BCS ranking. Fales has plenty of weapons at his disposal this season, including a pair of experienced wideouts in Noel Grigsby and Chandler Jones. Grigsby hauled in 82 receptions for 1,307 yards and 9 touchdowns last year, while Jones impressed with an eight-catch, 130-yard performance in the Spartans’ season-opening 24-0 shutout of Sacramento State last weekend. 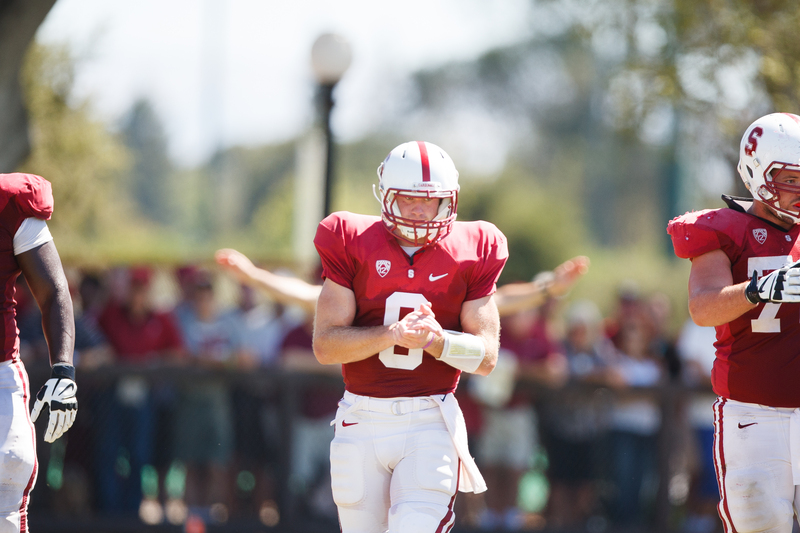 Stanford players are all too familiar with the playmaking abilities of Fales and company. In last year’s season opener, Fales gave the Cardinal a scare by consistently escaping from what seemed to be sure sacks and making accurate throws downfield. Only a late interception by safety Ed Reynolds — his first of many — allowed Stanford to escape with an unconvincing 20-17 win. Amanam certainly did his part in helping the Cardinal come out on top in last year’s “dogfight.” After making the transition from running back to defensive back his junior year, Amanam broke out in his first game as the starting nickelback with four tackles for loss — including two sacks — and a fumble recovery against the Spartans. And of course, Amanam would end his campaign on an even stronger note, as he was named the 2013 Rose Bowl MVP for his game-sealing interception. As for Stanford’s offense, much of the talk this offseason has been focused on its robust offensive line, which, at least from a depth standpoint, is shaping up to be one of the best units in school history. In between paving the way for the Cardinal’s stable of halfbacks on power run plays, the linemen hope to improve their protection of redshirt sophomore quarterback Kevin Hogan, who was sacked 11 times despite starting in just five games. After propelling the Cardinal to four consecutive victories over ranked teams — including No. 1 Oregon — en route to a Rose Bowl title, Hogan has grown more comfortable in his role as the leader of the offense. His maturation as the team’s signal-caller coincides with inexperience at the tight end and wide receiver positions. In fact, junior wideout Ty Montgomery is one of just two returning players who recorded double-digit receptions last season, and after being limited by a leg injury in 2012, the Texas native is looking to live up to his reputation as a deep threat in the passing game and a dangerous kickoff returner. San Jose State’s defense was ranked in the nation’s top 25 in scoring defense (21.3 points per game), total defense (344.7 yards per game) and rushing defense (122.2 yards per game), though the Spartans faced weaker competition in the Western Athletic Conference. But even as the future of the rivalry remains uncertain, tomorrow’s game is the top priority. 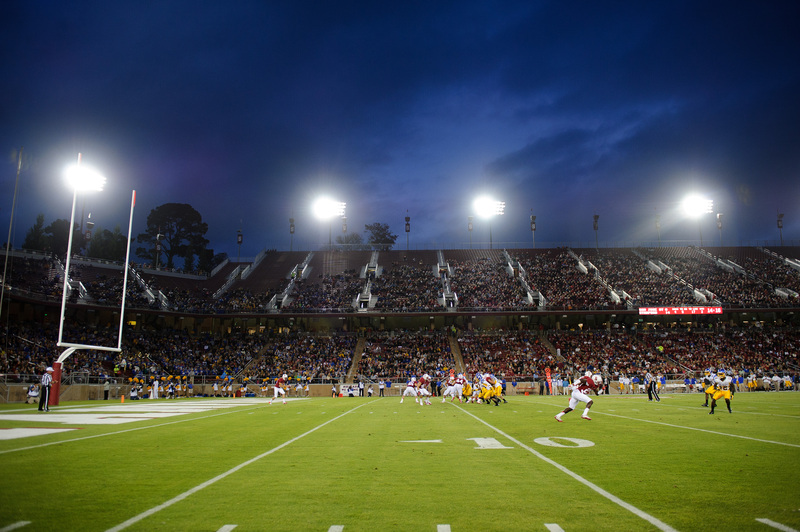 For the fans, tomorrow is about the long-awaited return of Stanford football. For the players, tomorrow is about the thrill of running out of the tunnel after an eight-month hiatus. And for Shaw, tomorrow is about his first chance to discover his team’s true identity. The Cardinal kicks off its 2013 season against the Spartans at 8 p.m. tomorrow, with television coverage on Pac-12 Networks. For in-game updates, check www.stanforddaily.com for our liveblog and follow @StanfordSports on twitter.